Lang CAT IV Digital Multimeter features Cat IV 600/Cat III 1000V for HEV work, High accuracy standard DMM, fuel injector pulse width testing, RPM measurements with included inductive pick-up, and a Limited Lifetime Warranty. Lang 10 Pack of Digital Thermometers. Lang Digital Thermometers feature a foldout stainless steel probe, a magnetic mount for hands-free use, a large and easy-to-read display. Min/Max value capture, and measurements from 58F to 572F. Lang digital thermometer. Foldout stainless steel probe. Magnetic mount for hands-free use. Large, easy-to-read display. Min/Max. 58F to 572F. Lang IP54 Infrared Thermometer. IP54 Splash proof certification. 12:1 distance/spot ratio. Min/Max, diff and lock. Backlit display -76F to 1022F. 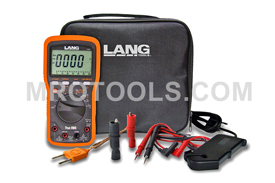 Lang automotive digital multimeter. ACV/DCV, ACA/DCA, resistance, diode, frequency, continuity, temperature. Duty cycle and dwell reading. RPM measurement. Lang CAT IV Digital Multimeter. Cat IV 600/Cat III 1000V for HEV work. High accuracy standard DMM. Fuel injector pulse width testing. RPM measurements with included inductive pick-up. Lang CAT IV Wireless Clamp / Volt Meter features wireless high amps, low amps, and voltage in one kit. View readings remotely from your phone or tablet, mA resolution for parasitic current drain, high currenjt clamp for starter and charging current. Lang Inductive Pickup for 13803 Lang Automotive Digital Multimeter and 13804 Lang Cat IV Digital Multimeter. 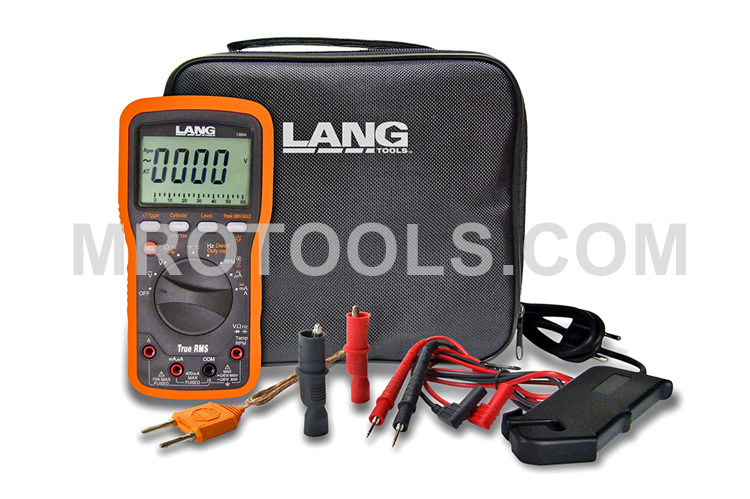 Lang Protective Case for 13803 Lang Automotive Digital Multimeter and 13804 Lang Cat IV Digital Multimeter. Lang Temperature Adapter for 13803 Lang Automotive Digital Multimeter. Lang Test Leads for 13803 Lang Automotive Digital Multimeter and 13804 Lang Cat IV Digital Multimeter. Lang Replacement Alligator Clips for 1176. Lang Replacement Test Probes for 1176. Lang Replacement Spring Hooks for 1176. Lang Replacement Set - Alligator Clips, Test Probes and Spring Hooks. Replacement set for 1176 (alligator clips, test probes, spring hooks). Lang Retractable Test Leads - 3 Leads X 10 Foot. Used for testing electrical circuits in cars, trailers, boats, and more. Retractable test leads pull out and rewind when not in use. Lang Retractable Test Leads - 1 Lead X 30 Foot. Used for testing electrical circuits in cars, trailers, boats, and more. Retractable test leads pull out and rewind when not in use. Lang Magnetic Retractable Test Leads- 3 Leads X 10-Foot. Used for testing electrical circuits in cars, trailers, boats, and more. Retractable test leads pull out and rewind when not in use. Lang Retractable Test Leads - 2 Leads X 30-Foot. Used for testing electrical circuits in cars, trailers, boats, and more. Retractable test leads pull out and rewind when not in use. Lang Magnetic Retractable Test Leads - 2 Leads X 30-Foot. Used for testing electrical circuits in cars, trailers, boats, and more. Retractable test leads pull out and rewind when not in use. Lang Retractable Test Leads - 2 Leads X 10 Foot. Used for testing electrical circuits in cars, trailers, boats, and more. Retractable test leads pull out and rewind when not in use. Lang Retractable Test Leads - 2 Leads X 15 Foot. With Banana Plugs. Used for testing electrical circuits in cars, trailers, boats, and more. Retractable test leads pull out and rewind when not in use. Lang 7-Piece Retractable Test Lead Set. . Used for testing electrical circuits in cars, trailers, boats, and more. Retractable test leads pull out and rewind when not in use. The 13804 Lang Cat IV Digital Multimeter is one of thousands of quality tooling products available from MRO Tools. Please browse Lang Digital Thermometers, Multimeters & Test Leads for tools similar to the 13804 Lang Cat IV Digital Multimeter. 13804 Lang Cat IV Digital Multimeter description summary: Lang CAT IV Digital Multimeter. Cat IV 600/Cat III 1000V for HEV work. High accuracy standard DMM. Fuel injector pulse width testing. RPM measurements with included inductive pick-up. Quantity discounts may be available for the 13804 Lang Cat IV Digital Multimeter. Please contact MRO Tools for details.